Azim says it was a Hindu family who gave him shelter when 'the two communities were baying for each others' blood'. AYODHYA: Mohammed Azim, an auto-driver in Ayodhya, still recalls the frightening night of December 6, 1992, when he along with a group of other Muslim residents of the temple town had taken shelter in the farm fields fearing for their lives. Azim, who was just 20 then, said, "An army of 'karsewaks', in a grip of frenzy, had brought down Babri Masjid, triggering unrest and panic. We were so terrified, we did not know what to do." The 46-year-old, now a father of four, feels upset that Ram Temple issue was again being raked up by some politicians and the Sangh Parivar, threatening the "fragile peaceful atmosphere" of Ayodhya, whose residents are still trying to come to terms with the tragedy 26 years later. "Every year around this time, we fight those emotions. We have tried to put the past behind us, but the tragic memories just refuse to go away. And, with all the noise around the temple issue in Ayodhya and elsewhere, it has opened our wounds again," he rued. Azim says the fateful night still flashes before his eyes. He says it was a Hindu family who gave him shelter when "the two communities were baying for each others' blood". "We were panic-stricken, so a group of us in our neighbourhood ran outside the town and into the farm fields to hide from a frenzied mob running amok in the streets," he told PTI. "We spent almost the entire night in the fields. It was a cold and painful night, I will never forget it. At the crack of dawn, we knocked on the door of a Thakur family, who knew me, and he sheltered us for a few days," he recalled as tears welled up in his eyes. Mohammed Muslim, 78, who now drives an e-rickshaw, gets perturbed talking about the incident and says he wished politicians and Hindu-outfits would not whip up communal frenzy. "We were unsafe then, and today also we feel insecure when an outside crowd comes to our town (referring to the recent Dharma Sabha of the VHP)," he said. Muslim, Azim and many other members from their community describe the incident as a "blot on democracy" when "mobs were allowed to take over the city". "The demolition first demoralised our community and then the ensuing violence in Ayodhya and riots in other parts of the country fractured our faith in the system. I had run away to Barabanki after the unrest in 1992, I was so terrified," Muslim recalled. But, it is not just minority community, which feels the pain, as Vijay Singh, a doctor who lives near the disputed Ram Janmabhoomi, said, the recollection of the incident sends chills down the spine. The 48-year-old medic says he was present in Ayodhya on the day the 16th-century mosque was demolished and saw the violence that followed in the holy city. "It was terrible. We do not want another Ayodhya tragedy," he said. "We want to preserve the peaceful atmosphere, but politicians stoke the fire to suit their agenda. 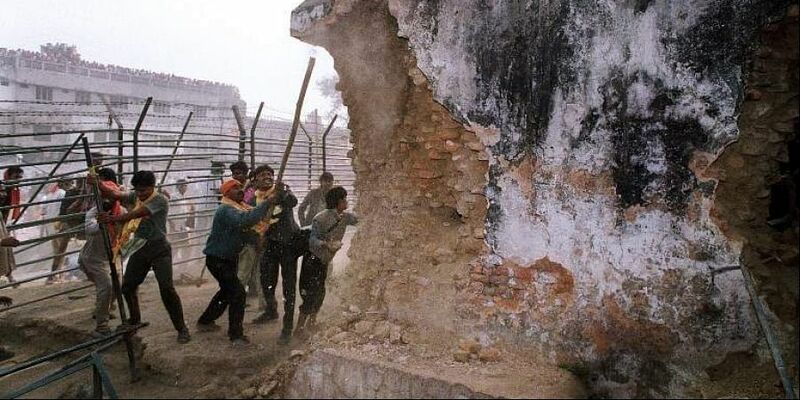 Even in 1992, so many people had come from outside to bring the structure (mosque) down. It was a very tragic and unfortunate incident that affects Ayodhya till this day," Singh said. Azim, Singh and many other residents of the holy town reckon that Hindu and Muslim communities have lived here in peace for ages, and even after the tragedy, no one wants any fresh political trigger for disharmony. Activist Shabnam Hashmi said Ayodhya has always been a place of ancient culture and communal harmony and alleged that its syncretic nature was "hijacked" in 1992, and the "city is still paying the price". Hashmi said in 1993, Delhi-based SAHMAT had organised a meticulous exhibition -- Hum Sab Ayodhya -- documenting the history, heritage, geography and culture of Ayodhya, accompanied by cultural programmes in various cities across India. In August 1993, Muktnaad, a mushaira was held in Faizabad and Muktnaad in Ayodhya, a unique, night-long cultural performance on the banks of Saryu at Ram Ki Paidi, where some of the noted artists performed. "The events were to let people achieve catharsis. It was the first event held in Ayodhya after the violence. It was the 'breaking of the ice', but it was not easy putting it together and had to run from Faizabad to Lucknow for permission," Hashmi said. "The anniversary, every year brings back the tragic memories. Politicians should let people's wounds heal and not reopen them to suit their agenda," she said.